Bennett's fracture is an unstable intra articular fracture of the base of the first metacarpal bone. It extends into the carpometacarpal (CMC) joint and is the most common type of fracture of the thumb. It is nearly always accompanied by some degree of subluxation or frank dislocation of the carpometacarpal joint and this subluxation/dislocation makes the fracture unstable. The mechanism of injury is that when an axial force is applied against a partially flexed metacarpal, there is a resulting fracture of the base of that metacarpal and usually associated with subluxation/dislocation. 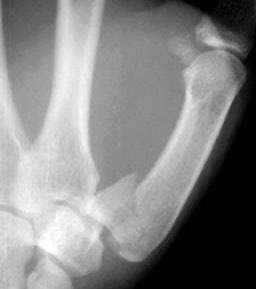 This fracture is common in cases of fall on thumb usually from bicycles and punching to a hard object. If intraarticular fractures (such as the Bennett's fractures) are allowed to heal in a displaced position, significant post-traumatic osteoarthritis of the base of the thumb can occur.